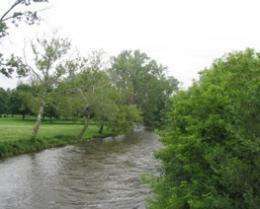 (PhysOrg.com) -- In an effort to keep lakes and streams clean, municipalities around the country are banning or restricting the use of phosphorus-containing lawn fertilizers, which can kill fish and cause smelly algae blooms and other problems when the phosphorus washes out of the soil and into waterways. But do the ordinances really help reduce phosphorus pollution? That's been an open question until now, says John Lehman, professor of ecology and evolutionary biology at the University of Michigan. "It's one of those things where political organizations take the action because they believe it's the environmentally conscious thing to do, but there's been no evidence offered in peer-reviewed literature that these ordinances actually have a salutary effect," Lehman said. Now, such evidence exists in a study published by Lehman and students Douglas Bell and Kahli McDonald in the journal Lake and Reservoir Management. The paper, published online Aug. 14, shows that phosphorus levels in the Huron River dropped an average of 28 percent after Ann Arbor adopted an ordinance in 2006 that curtailed the use of phosphorus on lawns. Phosphorus is naturally plentiful in southeast Michigan soils, so fertilizing established lawns with the nutrient is generally unnecessary. Lehman was in an ideal position to assess the effectiveness of the Ann Arbor ordinance because he and undergraduate student Julie Ferris were already studying nutrient levels in the Huron River and two downstream lakes, Ford Lakes and Belleville Lake, for a different research project. Ferris used some of the data from that project in her senior honors thesis, and she and Lehman published a paper on the Ford Lake and Belleville Lake research, but they weren't sure what to do with the rest of the data from the Huron River around Ann Arbor. "As we were talking about it, I got a phone call from Ann Arbor environmental coordinator Matt Naud, who knew about the work we had been doing," Lehman said. "He said the city council had enacted an ordinance that would reduce the use of phosphorus-containing fertilizers, and he wondered if we would be able to detect any change that might occur as a result." Using statistical models, Lehman and Ferris figured out how much sampling would be required to confidently detect a 25 percent decrease in phosphorus concentrations. "We came up with the result that for most of the river that runs through Ann Arbor, we should be able to detect a change of that magnitude by sampling once a week for one summer or two summers, depending on the sampling station." Naud found funding to pay a student to do the work over the next two summers. By that time, Ferris had graduated and gone on to medical school, so Lehman recruited Bell to do the sampling and chemical analyses. When Bell graduated and took a job measuring phosphorus on research cruises around Bermuda, McDonald joined the project. "Right away, we started to see decreases," Lehman said. After the first year of data collection, it was clear that phosphorus concentrations were lower after the ordinance was enacted than before. But did the ordinance cause the drop? Though that explanation seems likely, public education efforts and general increased environmental awareness among Ann Arbor residents also may have entered in. At any rate, the study already has attracted the attention of the Southeast Michigan Council of Governments (SEMCOG), which invited Lehman to present the study results at a meeting earlier this year, and may well generate interest beyond Michigan's borders. "Although the science wasn't difficult, its ramifications in a political sense and in an environmental sense will not be insignificant," Lehman said. What is the source of your stats and info? ?